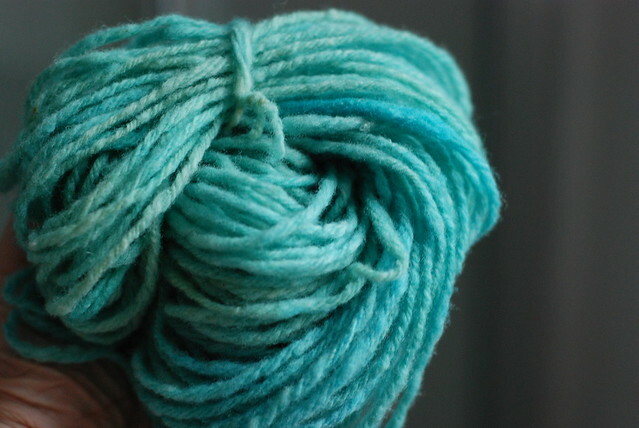 My little skein of yummy, bouncy Bowmont got dyed with food colors into a nice turquoise. This was a learning experience, because British food colors aren't the same as American ones and not all of them will dye wool. The I'd Dye for Britain Ravelry group has a thread full of great information on this. After dyeing, there was nothing left to do but knit! 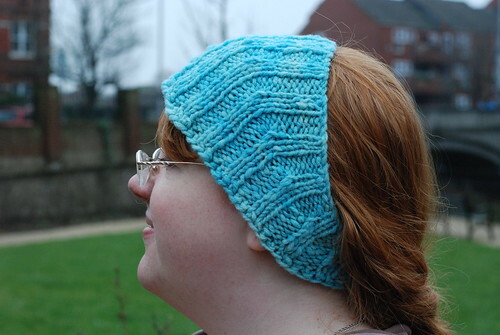 My pattern of choice for tiny amounts of handspun, and also for people with cold ears, is Calorimetry. In fact, I've knit two other handspun Calorimetries this winter as gifts (also hand-dyed, from some leftover J&S superfine Shetland top). The pink Calorimetries were the standard pattern, knit flat with a button - for my own one, I decided to mix it up. I cast on to knit in the round. 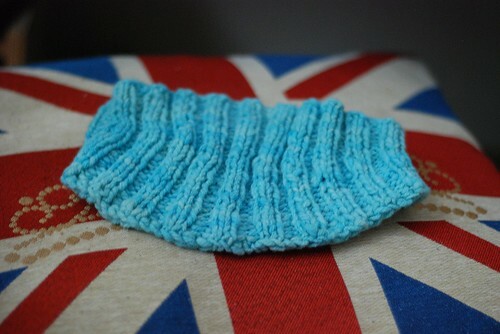 Because Calorimetry is made of up short rows, the majority of the knitting is exactly the same as a flat version. The only difference is the first few and last few rows which are knit around. I never used the button on my previous Calorimetry, so this was an ideal modification for me. I knit it in a single evening at Knit Night. The Bowmont yarn gives me the warm fuzzies - and not just because it's warm and fuzzy. The Bowmont breed was developed in the UK from Shetland and Merino sheep - it's soft like merino but with a really long staple length (my fleece was between 5-6"). I'm hoping the long staple will reduce pilling - the combination of long staple and a many-plied yarn should make for a lot of durability, relatively speaking, as fine wools are not known for being very robust. My little headband is a luxury, but I hope to get a lot of wear out of it too. There aren't a lot of flocks of Bowmont sheep around, but Bowmont is gaining notoriety as "the British Merino" - there has been some commercial Bowmont yarn produced, Bowmont Braf, and also a small range of Bowmont knitwear. It's certainly the softest British sheep I've ever felt - only the finest Shetland could compete.